The tank is made of linear low-density polyethylene suitable for the storage water, as well as, for the storage of other liquids, and it is made using the rotational molding method. The material used is Ultraviolet stabilized for more protection against the sun. The tank in color: white (or gray) - outside and black inside, combines the good external appearance with the obstruction of the light inside the tank, avoiding the creation of algae. 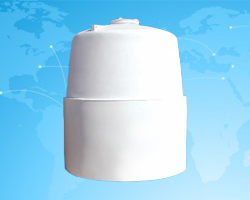 The tank is equipped with a screw-type double-layer lid to avoid insertion of dirt inside the tank and at the same time to allow for normal ventilation. In case the tank will be used in combination with a pump, then the use of an external vent is necessary.